Charles Thomson (1729-1824) was an American patriot in Philadelphia during the American Revolution and Secretary of the Continental Congress (1774-1789). 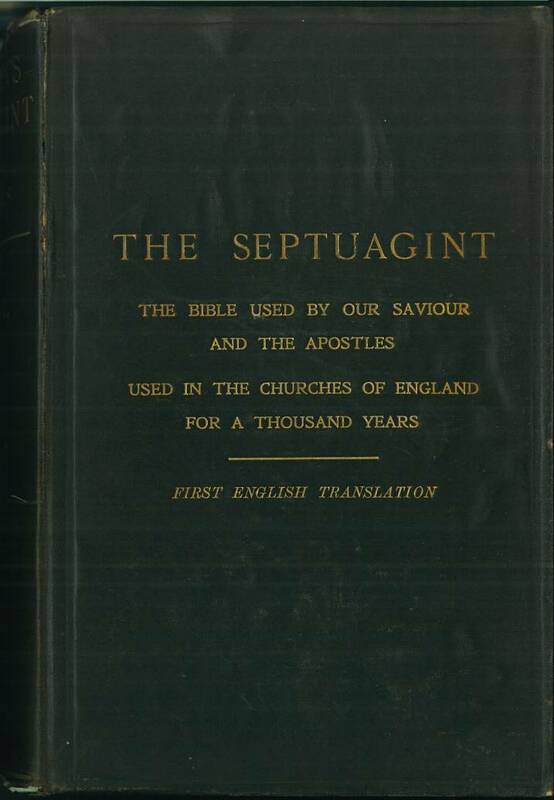 In addition, he was the first person to translate the Greek Septuagint into English and the first American to translate the New Testament into English. His translation of the Bible was printed in 1808 by Jane Aitken (daughter of Robert Aitken who printed the first English Bible in America) who was the first woman to publish a Bible in America. 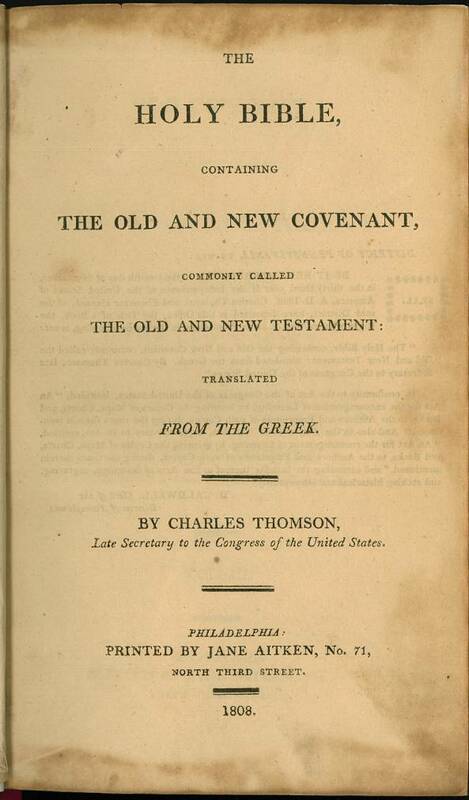 In 1815 Thomson published a translation of the Gospels arranged as a harmony. 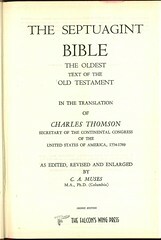 Click here for sample verses from the version by Charles Thomson. Title: The Holy Bible, containing the Old and New Covenant, commonly called the Old and New Testament: translated from the Greek. By Charles Thomson, Late Secretary to the Congress of the United States. Philadelphia: Printed by Jane Aitken, No. 71, North Third Street. 1808. References: Chamberlin 19-1; Herbert 1514; Hills 153, O'Callaghan p. 91; Taliaferro-BVE CN00200, Taliaferro-EELBV 7255.100. 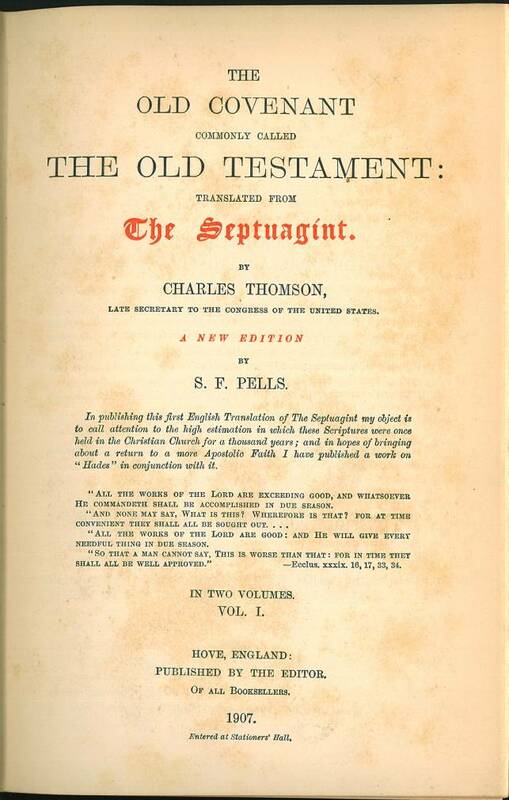 Title: The Old Covenant, commonly called the Old Testament: translated from the Septuagint. By Charles Thomson, Late Secretary to the Congress of the United States. Vol. I. Philadelphia: Printed by Jane Aitken, No. 71 North Third Street. 1808. Imnages: Volume I Title Page (from the on-line facsimile). 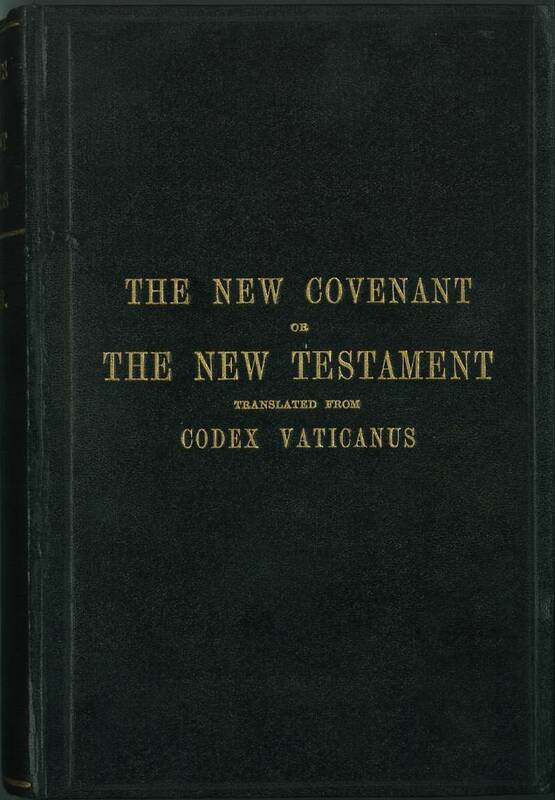 Title: The Old Covenant, commonly called the Old Testament: translated from the Septuagint. 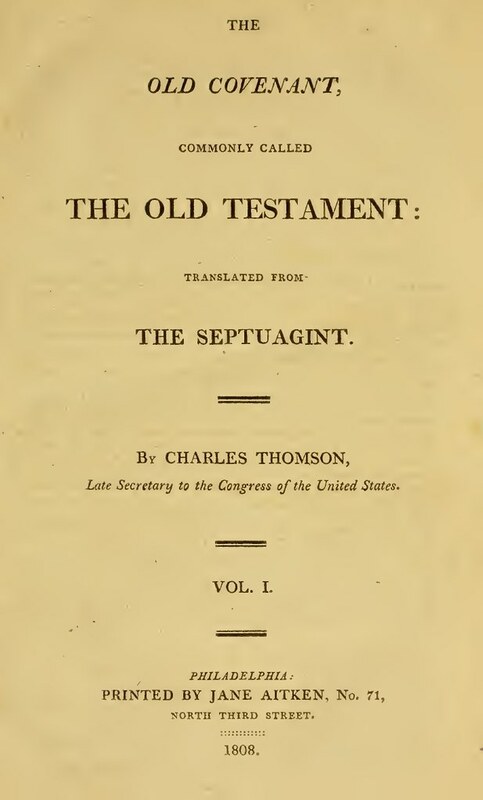 By Charles Thomson, Late Secretary to the Congress of the United States. Vol. II. Philadelphia: Printed by Jane Aitken, No. 71 North Third Street. 1808. Images: Volume II Title Page (from the on-line facsimile). Title: The Old Covenant, commonly called the Old Testament: translated from the Septuagint. 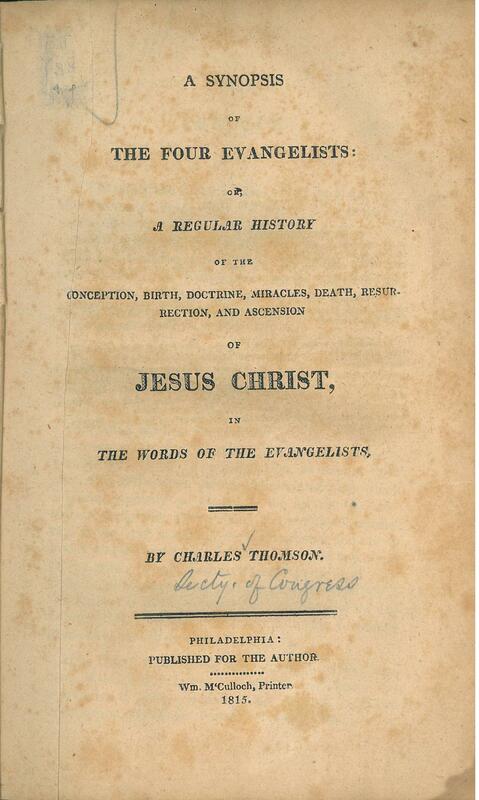 By Charles Thomson, Late Secretary to the Congress of the United States. Vol. III. Philadelphia: Printed by Jane Aitken, No. 71 North Third Street. 1808. Images: Volume III Title page. 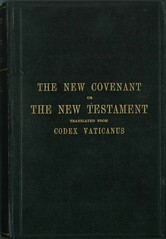 Title: The New Covenant, commonly called the New Testament: translated from the Greek. 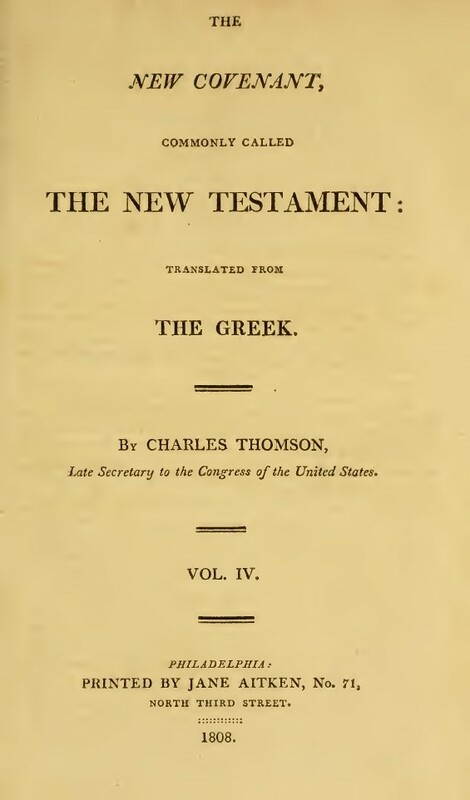 By Charles Thomson, Late Secretary to the Congress of the United States. Vol. IV. Philadelphia: Printed by Jane Aitken, No. 71 North Third Street. 1808. Images: Volume IV (NT) Title page (from the on-line facsimile). 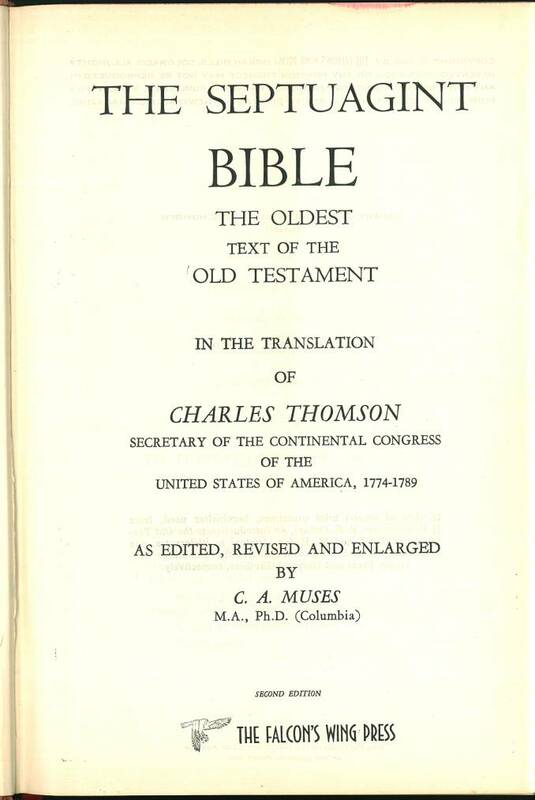 A complete four volume first edition of Thomson's Bible was offered on abebooks for $6850 in July 2008. 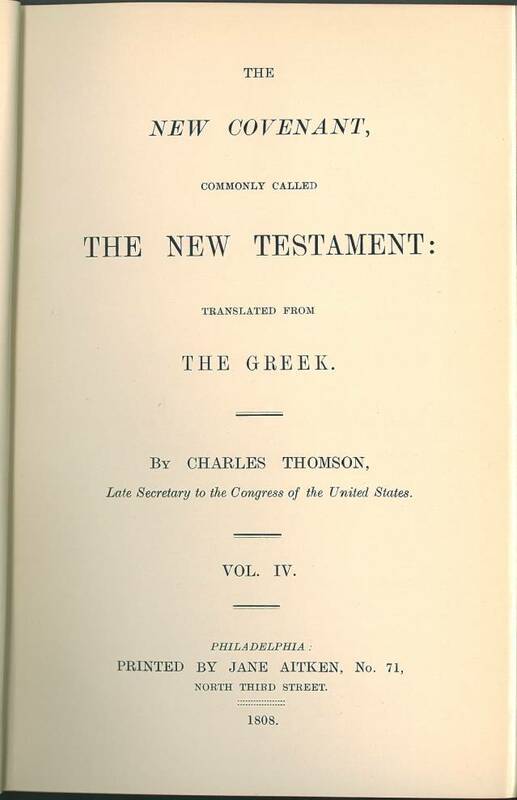 In his Preface Thomson writes, "I determined to use a literal translation of the very words of the Evangelists; and not to omit a single verse of any of them; nor add any thing of my own; except, merely, for the purpose of connection, or explanation of peculiar phrases, or technical terms; and in order to distinguish from the text the additions, which I found it necessary to make, I resolved to enclose them in brackets, thus, [ ]." 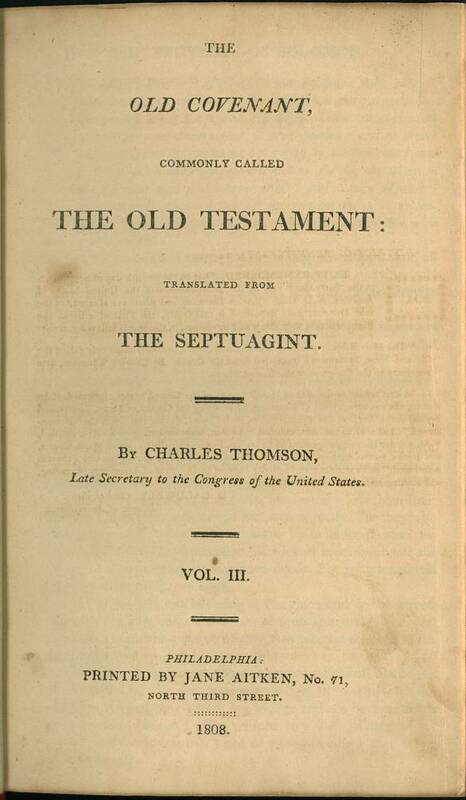 This translation differs from Thomson translation of the New Testament published in 1808. Title: A Synopsis of The Four Evangelists or A Regular History of the Conception, Birth, Doctrine, Miracles, Death, Resurrection, and Ascension of Jesus Christ, in the Words of the Evangelists, By Charles Thomson. Publisher: Philadelphia: Published for the Author. Wm. M'Culloch, Printer. 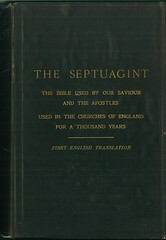 Contents: Title, Preface (p. iii-iv), Synopsis divided into LII (52) sections (p. 1-200), Notes (p. 1-50), "An Index to find every verse in the four Evangelists (2 unnumbered sheets). References: Chamberlin 636-1, Hills see 153, O'Callaghan p. 128. Location: Worldcat list of libraries holding this volume. S.F. 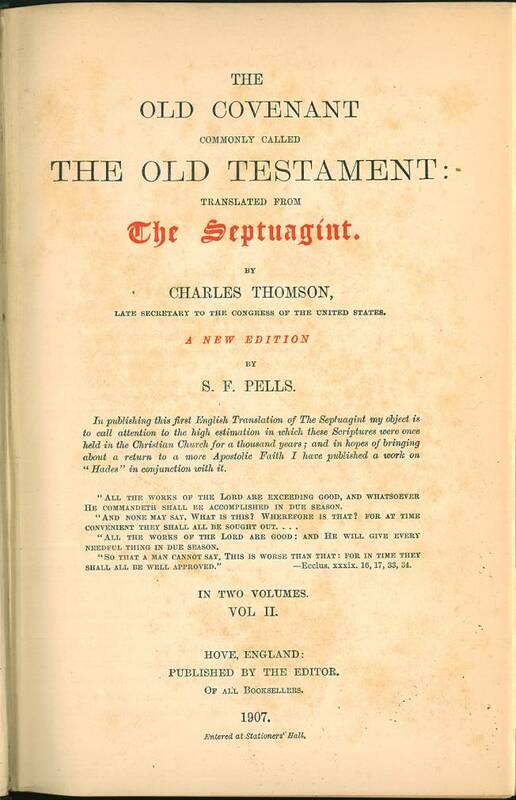 Pells reprinted Thomson's complete Bible in what appears to be a facsimile edition. 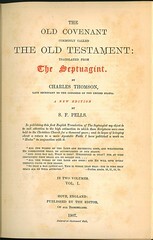 He reproduced Thomson's general title (following his preface) and the Volume I title at the beginning of volume I and Thomson's New Testament title page at the beginning of volume III. 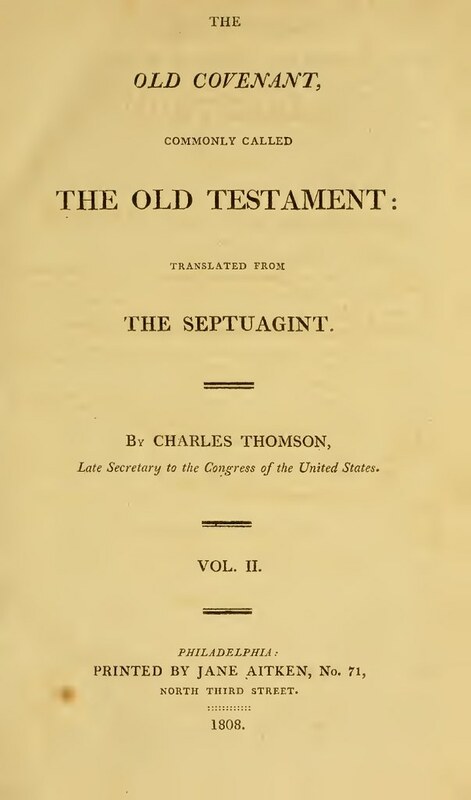 Title: The Old Covenant commonly called the Old Testament: translated from The Septuagint by Charles Thomson, late Secretary to the Congress of the United States a new edition by S. F. Pells. References: Chamberlin 19-1, 114-2; Herbert 2134; Taliaferro-BVE CN00200, see Taliaferro-EELBV 7255.100. 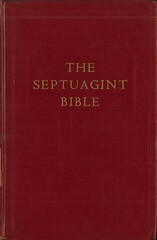 Facsimile: A facsimile of Volume 1(1904) and Volume 2(1904) are available at www.archive.org. 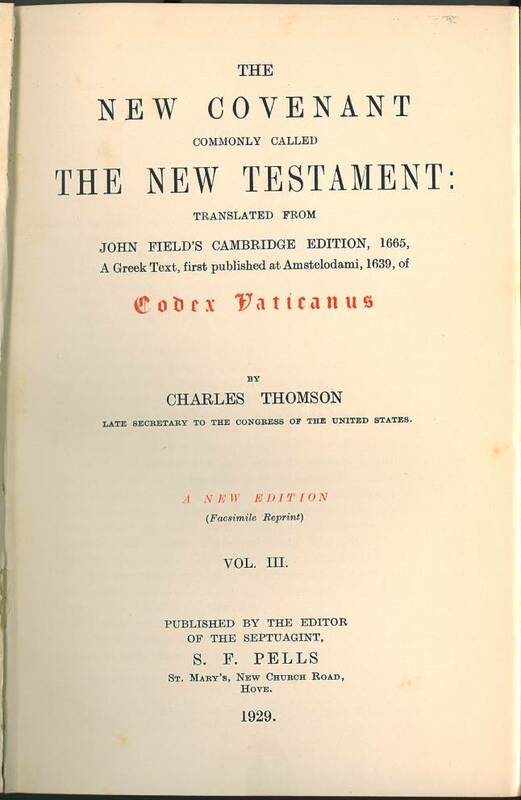 Title: The New Covenant commonly called The New Testament: translated from John Field's Cambridge Edition, 1665, A Greek Text, first published at Amstelodami, 1639, of Codex Vaticanus by Charles Thomson Late Secretary to the Congress of the United States. A New Edition (Facsimile Reprint) Vol. III. 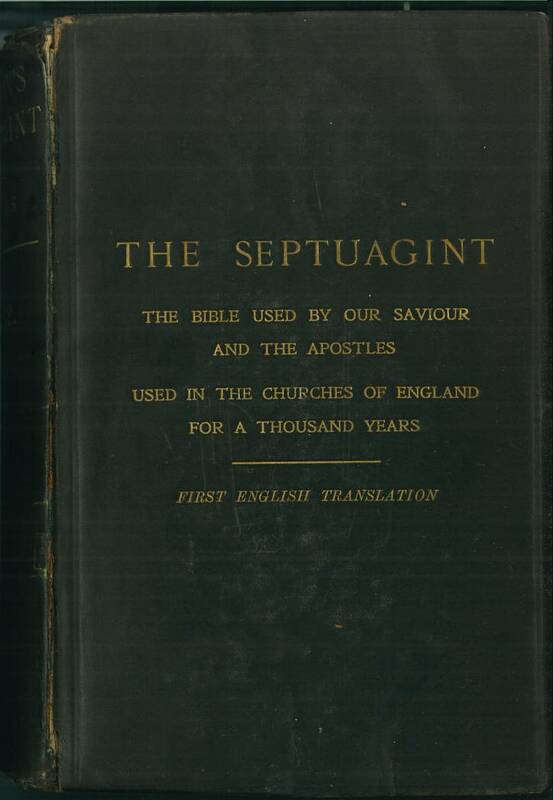 Published by the Editor of the Septuagint, S.F. Pells St. Mary's New Church Road, Hove. 1929. References: Chamberlin 19-1; Taliaferro-BVE CN00200, Taliaferro-EELBV 7255.100. 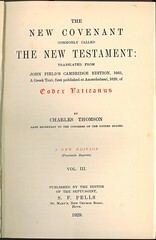 Date: Thomson's translation was published in 1808 and Muses' reprint/revision was printed in 1954 and reprinted in 1960. References: Chamberlin 19-1, 114-2, 124-1; Hills 2540; Taliaferro CN00314, Taliaferro-EELBV 7255.110. 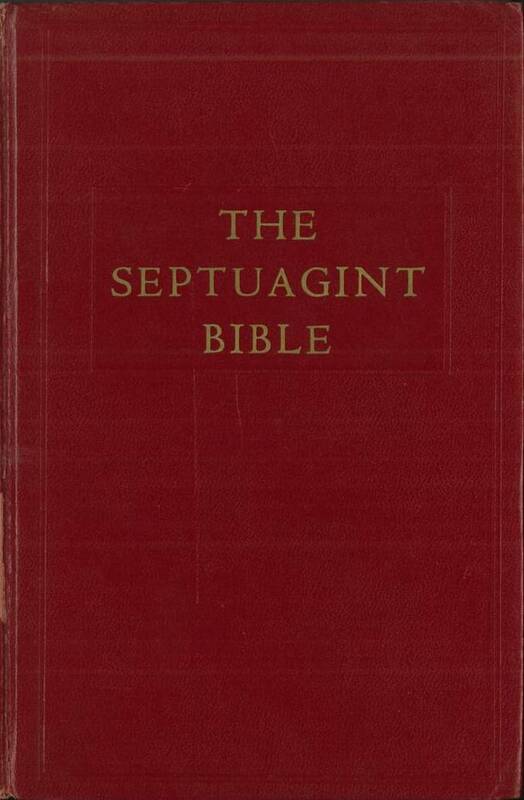 Comments: This edition contains some changes made by Charles Thomson in his own copy of this Bible and the material from the Septuagint version of Esther that is found in the Apocrypha.